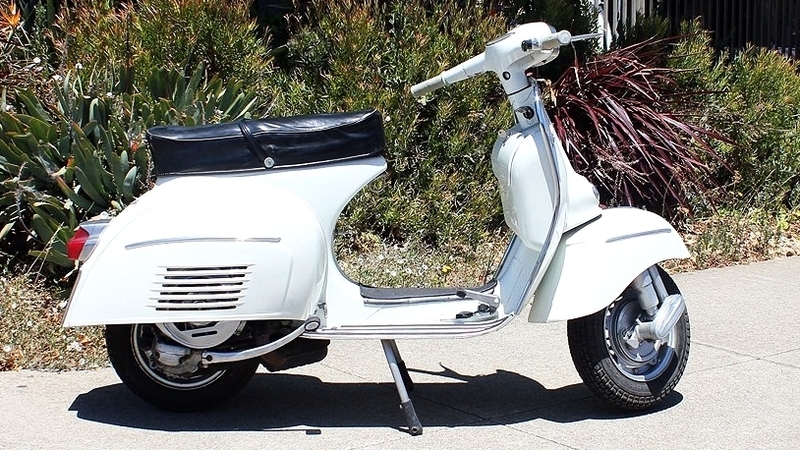 We have recently found this wonderful Vespa 150 in Italy, and it is now on its way to San Francisco. We have recently acquired this really nice Vespa 150 in Italy. and it is currently in our Italian workshop. We recently acquired this nice Vespa Sprint 150 in Italy. This Vespa was firmly within the very early design era. The scooter has been restored, and is in very good condition overall. While probably not appropriate to be your daily driver, this would be a fun weekend cafe runner, or a huge hit at any scooter or collector car event. These early Vespas are extremely rare in the US (and even rare in Europe too! ), as Piaggio would not begin sales here for several more years. The rod model Vespas are special scooters. In the early years, Piaggio was still refining their design.This is one of the last of the early scooters with the rod linkage system used on the very early models. These early 50’s scooters were not originally sold in the US, and are getting very difficult to find even in Europe. This scooter was restored in Italy before we acquired it, and looks extremely nice. The early faro basso scooters are just beautiful, and this one is no exception. 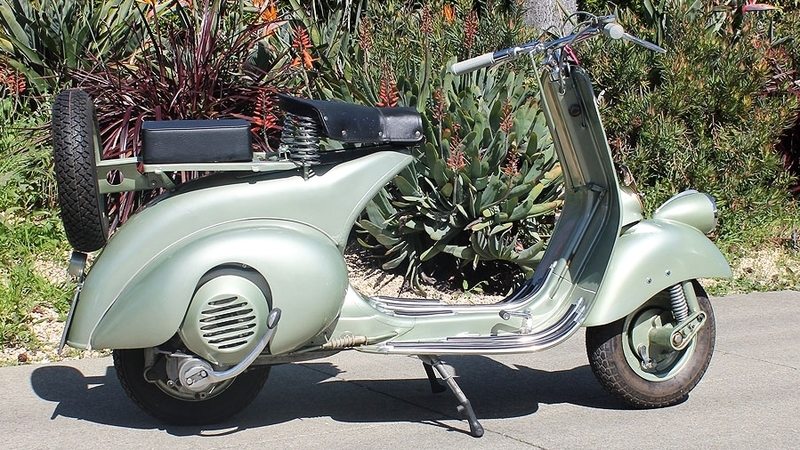 Look no further for the iconic “Roman Holiday” style.This is certainly a scooter for the serious collector. We have recently uncovered this beautiful faro basso in Italy. It has just included with our latest shipment from Italy to San Francisco. The scooter itself is a 1952 “V32” model, which is the prefix for the frame number. The V32 was made earlier in 1952, while the V33 came later in the year. We found this extremely rare piece in Italy. This scooter comes out of the Marco Marini collection. It was restored in Italy, and has seen very few miles since the restoration. This is certainly a very nice scooter and would be a wonderful addition to any serious vehicle collection. The faro basso scooters are just knockouts in our book, and this 1952 shows how good they can be. You can be sure, this is a scooter that will turn heads wherever it goes, to really show off and be proud of. The wide handlebars and low seat-height combine to create a riding experience like no other vehicle. The Faro Basso Vespa is a classic design for all time. These were built in a different era when life moved at a slower pace. Solid and well-built machines, these early Vespas are rugged, but look sophisticated. This scooter is like a time warp. It feels like buying a new 50’s scooter. 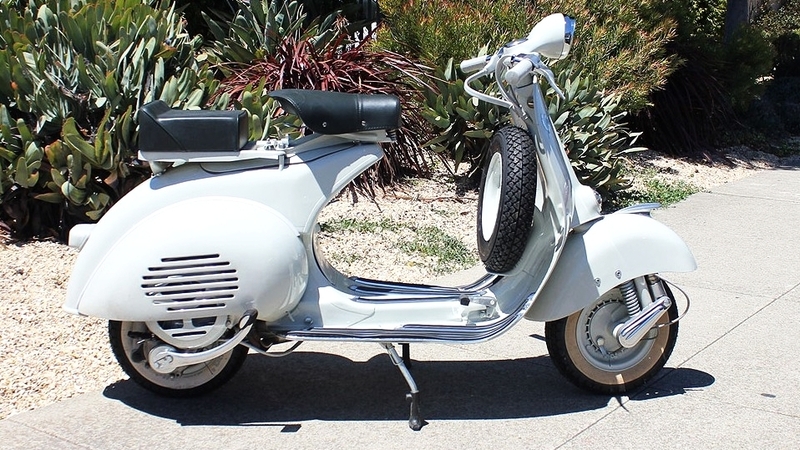 If you have been looking for a 50’s Vespa, this is a serious contender. This is the sort of scooter that gives one a real sense as to why people walked into a showroom and bought one. This scooter was restored from the ground up in our Italian shop. This is an extremely nice 1956 Vespa. We restored this scooter from the ground up in our Italian restoration shop. What a beauty! The G.S. 150 was arguably the most stylish scooter of all time. It ranks among the most desirable Vespas. The VS2 were never sold in the US, and they are extremely rare, even in Italy. A great example of one of the most beautiful of the Vespa designs. This is a mild period-custom, with excellent paint and amazing style. It is silver but has more of a matte finish rather than a glossy look that would have been stock. One of the most stylish Vespas, the GS150 epitomizes 50’s design. The Vespa GS 150 had a long production run, and the last version was the “VS5.” Fast and smooth, the VS5 was the benchmark for scooters in its days. In the ‘60s, this vespa did set the standard for what a scooter should be: stylish and reliable. Even though it was not particularly fast, it had enough power to cope with the urban environment. The Vespa VBB was the scooter that powered Piaggio’s scooter lineup in the early 60’s, and for that matter, Italy. This scooter was restored in Italy to a high standard. It looks great from any angle and in outstanding conditions, it looks good from anywhere you look at it. 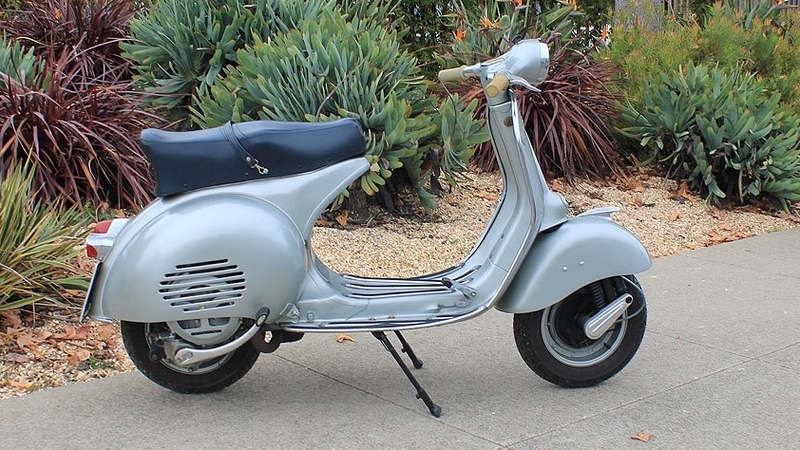 One of the most sought-after of all the Vespas made only for a short time. It is a Series 1 GS 160, but also has the glovebox from a Series 2 GS. The best of both worlds! This scooter is in amazing conditions. The paint has a few scratches here and there, but it is in superb condition overall. When it first debuted, it was a clean break from the 1950s scooters that had preceded it. In the mid-60’s, the Super Sport was the top of the line Vespa. Sleek and sporty, the Super Sport certainly has presence. It is a scooter that really straddles the transition of the Vespas from the old style to the new. Made for a few years, not that common today, they were the top sporting Vespa of their time. This is a scooter that can still zoom through fifty years after it was made. One of the best Vespas ever made, in completely original conditions. There are not many left like this one. Surely eye-catching, this model was the last to retain the piston-ported style motor used by Piaggio from the very first Vespas, yet they kept a modern styling. This is a very early first year production G.L. The Vespa G.L. is one of the most harmonious of the Vespa designs. It just looks right from every angle. The Vespa G.L. is one of the most harmonious of the Vespa designs. It just looks right from every angle. The soft curves and nice trim set it off nicely. The GL is certainly a pretty scooter, and one of our favorites. We restored this one inside and out. Everything that could be replaced or refurbished on this scooter has been, and she’s now ready for a new owner. This scooter couldn’t look more vintage, with its light green paint. It is a scooter that is made for riding regularly. It isn’t so precious that you will be afraid to ride it, but it sure has a stylish look to it. This scooter has seen some action, that’s for sure. It was ridden, and then ridden some more. Then, shipped from the old country to the US. Still in the original paint, though weathered, it hides nothing. It is hard to describe how much fun this scooter is to ride. It is wickedly quick, yet reliable. The GTR was not sold in the US, but it is essentially the 125cc version of the Vespa Sprint. This scooter has had a top quality restoration and is one of the best 90SS’s that we have ever seen in terms of restoration quality. The 90SS is one of the most sought-after of all vintage scooters. They rarely come up for sale in the U.S.
Once, these were seemingly everywhere in Italy. You saw it by the thousands and could not get out of the way in time as swarms raced through the streets of Rome: this scooter was the first taste of freedom for all teenagers. This is the scooter that mobilized Italy. In the 1970’s, the entire country was full of them, adding style and fun to people’s daily routines. This is an excellent example of that era. The ET3 was the final version of the original Vespa smallframe design. They are ideal scooters for every-day city riding. It is hard to beat the Vespa Primavera for effortless fun. The Vespa 50 meant freedom to a whole generation of Italians. Catch that feeling with this sweet scooter with mild performance upgrades. If you want to experience 1970’s Italy, we can think of no better way! The Vespa 50 got lots of people on two-wheels with style. Fun and easy to ride, this would be a fantastic way to get into scootering for the first time, or to re-ignite your old passion. The ET3 was last and best version of the Vespa smallframe design. This one looks great, and has a bit of added performance modification to the motor. This scooter has had some nice performance modifications. Beyond that, this is just a very clean and tidy build. It is a late-model 50, and has the hallmarks of its era. The PK is a sort of love-it-or-hate-it design, but we love it. While clearly a product of the 80’s, the design is coming back to gain a new crop of admirers. Here we have a really cool P200 that has been customized for high performance. It has some really nice upgrades to the motor, and boy does this scooter get down the road. The 125cc version is a good scooter to start off riding, offering the advantages of low price and reasonable speed. We have spent some time on this scooter to make it nice and reliable. This is a "high option" model for Italy, and it has the auto-oil injection system, for ease of operation. The P200 is a great way to jump into the vintage scooter world. These motors really sing! They accelerate as fast, if not faster than the 200cc Vespas. These scooters were never sold in the US, since Piaggio had stopped selling scooters here by the time of the T5 debut. A vintage scooter with a lot of modern upgrades. They are smooth and comfortable: there are a huge amount of aftermarket accessories and parts available to customize it. The PX's are a joy to ride, they are smooth and comfortable. This one is number 308 out of a total of 500 sold. As a daily driver, this is the sort of scooter that is an excellent compliment to a vintage “weekend rider” scooter. The style is unmistakably Vespa, and most certainly cool. This scooter really turns heads. It was meant to be a limited production scooter from the outset, so they are always going to be rare. The Vespa Sei Giorni was produced in numbered edition and became part of the legend, built specifically for the taxing “Sei Giorni Internazionale di Varese” regularity competition of 1951.